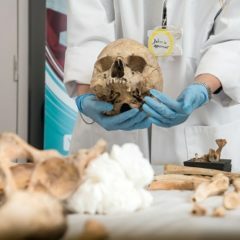 The Yorkshire Museum has exciting and vibrant exhibitions on Roman and Medieval York as well as the science of Extinctions. With dedicated learning labs and lunch spaces it is an unmissable venue for a school visit. 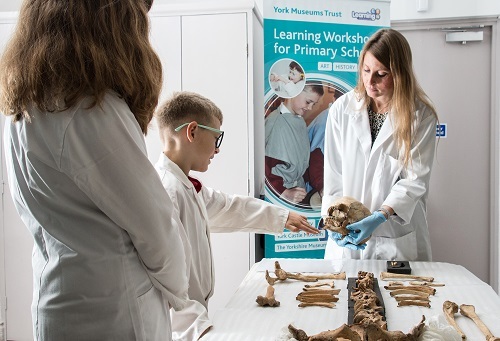 Workshops have been created by teachers and are based on the National Curriculum covering Greeks, Egyptians, Romans, Vikings, Medieval and Tudor life as well as Science and Art. Children will dig for fossils and identify the fossils they find. There is chance to handle real dinosaur fossils and discover how fossils are made. Activities include making a fossil cast to take home, designing their own camouflaged dinosaur and doing the dinosaur walk! Pupils have to plan a festival of celebration for their new city state in this interactive workshop. The first decision is to decide which God they want to represent them. 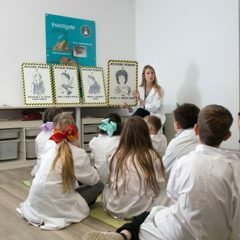 They are assisted in this by a proud, retired Greek athlete who helps the children discover more about everyday life in Ancient Greece, through handling genuine museum artefacts. Pupils take part in a circus of hands-on activities included rehearsing a play telling the story of Perseus, practising the long jump for the celebration games, making a peplos and dressing for the festival. The group meet a Victorian Egyptologist who is investigating the mysterious tomb of Kemmet. 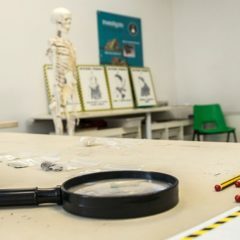 To discover the lost statue of Anubis pupils must work through a series of challenges including the mummification and embalming process in using our specially constructed mummy, wrapping a mummy and making their own amulet. 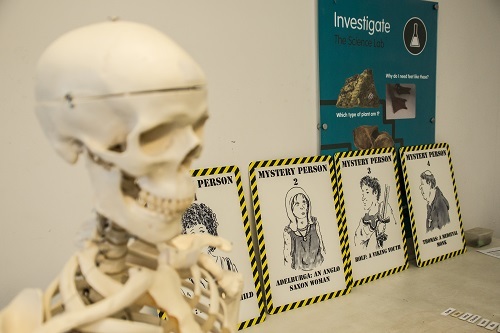 Pupils also handle genuine Egyptian artefacts to explore Egyptian beliefs about death and the afterlife. If they can decipher the final hieroglyphiAc message of Kemmet and apply their knowledge of the Egyptian Way of Death they may discover where the statue is hidden. This workshop covers how we know and find out about the past before written history. 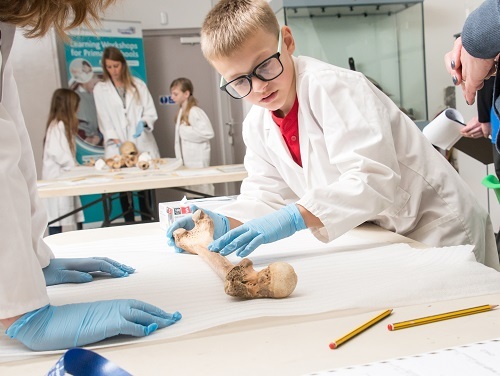 Pupils can handle prehistoric objects from the Stone Age, Bronze Age and Iron Age and discuss what life was like in each period and identify some of the key developments. 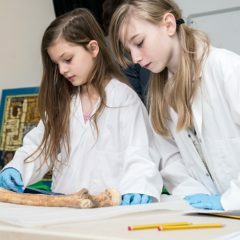 There are hands on activities to take part in for pupils to explore some aspects of every day life including; building a stone age shelter and dressing for a ritual, making and decorating a bronze age pygmy cup and creating colourful iron age jewellery. Pupils meet the Censor for Eboracum, who has needs their help to complete his records and correctly identify the citizens from the slaves. Pupils dress as Romans and then through handling real artefacts and taking part in hands on activities the pupils investigate the lives of six characters who lived in Roman York. The activities include using a quern stone, creating roman hairstyles, building a roman arch, trying on replica roman armour. The session brings to life how both the rich and poor lived and involves pupils in teamwork and problem solving. Pupils discover what it was like being a soldier in the Roman army and living in the Fortress of Eboracum (Roman York). 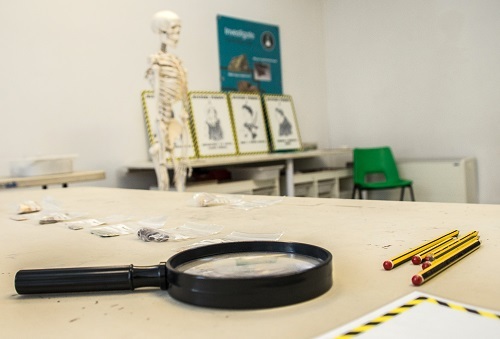 Pupils will explore Roman military artefacts and learn about soldier’s equipment, armour, battle formations and weapons before being put through their paces in a drill session. In groups, pupils design and build their own model catapult to discover who has the most fire power! This is a special session that can be added onto Legionary’s Life for £25. Pupils will meet Oshere the Thane or his wife Aelle, and decide if they are willing to be Oath Helpers for Eadgar, accused of stealing bread made for the Thane’s feast. The session explores life in Anglo Saxon York in the 11th century. Pupils can handle museum artefacts and take part in activities to find out about home life, manufacture, artistry and religion in Eoforwic. Activities include braiding, taking part in a ‘feast’, dressing up and practising intricate engravings. Pupils are prompted to imagine that they have travelled back 1000 years in time to experience Viking life first hand. 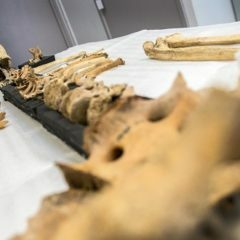 Costumes and Viking names help to set the scene of a Viking village in Denmark whose inhabitants have to vote on whether or not to set sail in a longboat for a new life, and decide what to take. The class act out a saga of a perilous voyage to Jorvik and on ‘arrival’ make some leather belts to sell. Who were the Vikings? When did they come to York and how did they live? In this workshop, the class are introduced to a family of six characters and explore everyday life in Jorvik, from food and clothes to playing and working. Hand’s on activities include grinding grain on a quern, playing trip trap troll, weaving and writing; children will also handle genuine objects. This session explore Anglo Saxon and Viking invaders and settlers. Pupils will discover the story of the Anglo Saxon and Viking struggle for England and how rule in York changed between 410 AD (when the Romans left) and 1066 AD. 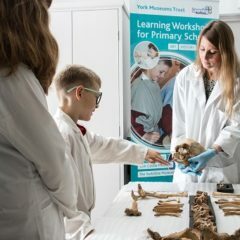 Pupils will handle museum artefacts which demonstrate why York was an important target for Viking raiders and take part in practical activities to reinforce the chronology of the period, including participating in a costumed timeline. The session also includes the stories of Kings and Rulers such as Athelstan, first King of England and Eric Bloodaxe. 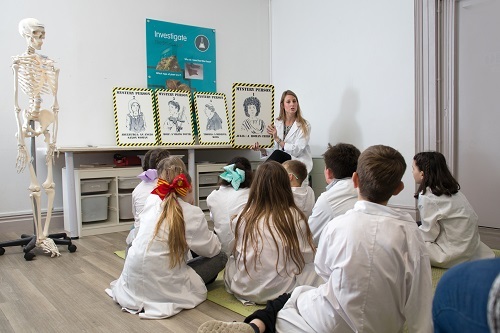 Pupils wear white coats and become scientists to discover what fossils are and what we know about the dinosaurs by studying them. 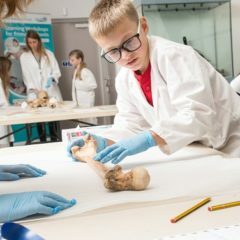 They will handle fossils and dinosaur bones – and there is chance to see and hold fossilised dino poo! Pupils will make their own fossil casts and design their own camouflaged dinosaur to take home. 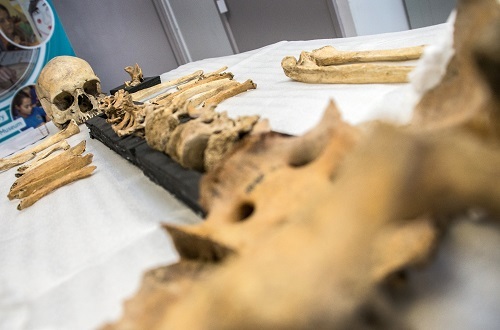 A skeleton has been found in the Museum Gardens. 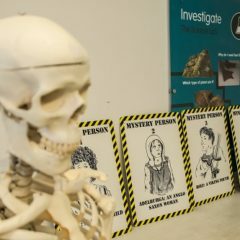 The pupils become forensic scientists to investigate the evidence to find out who that person was: a Roman child, a Viking warrior or a Medieval monk? 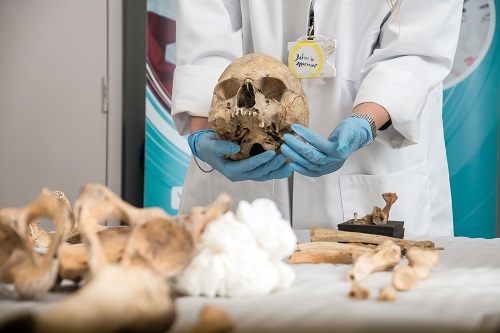 The groups will undertake a number of scientific and archaeological investigations to determine the gender, age and means of death of the skeleton. Look out for the Red Herrings too! 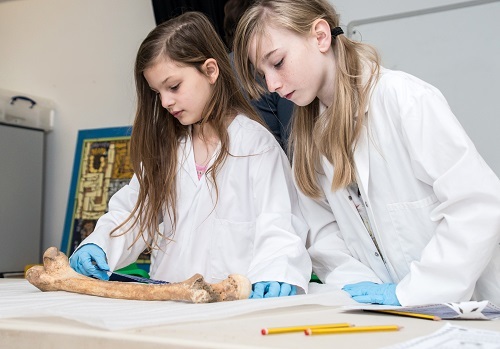 Pupils have the chance to handle real artefacts and examine real human remains. Take a look at our gallery below!